Even if Cyprus reunification talks went off track Thursday, the Turkish Cypriot president said they support a bi-zonal and bi-community federal state and have never given up on the reunification talks. “We have a week until [next] Thursday,” when talks are due to resume, said President Mustafa Akinci after receiving a delegation from the Bi-communal Peace Platform on Friday. “We will wait to see the next steps,” Akinci said. “We want a resolution and peace on this island,” he added, saying that the Greek Cypriots should work to restore confidence. 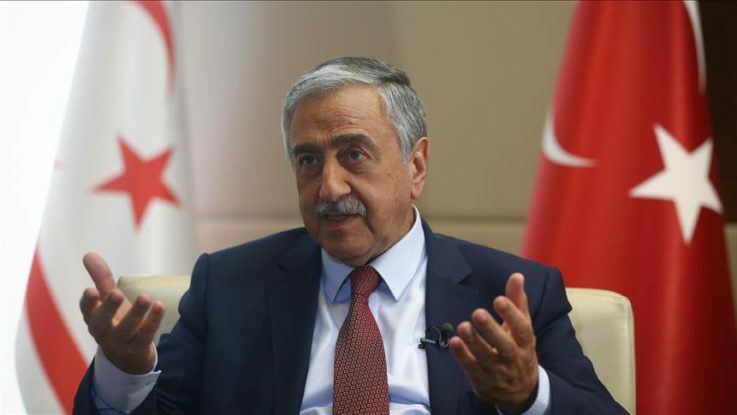 Akinci told reporters Thursday that the unification talks ended abruptly when Greek Cypriot leader Anastasiades angrily walked out of the room. The sudden walkout was triggered when UN Cyprus Envoy Espen Barth Eide expressed concern about a Greek Cypriot move to commemorate a 1950 referendum on “Enosis,” or union with Greece, sowing unrest among the Turkish community. When Eide said action was needed to address this, Anastasiades “said ‘there is nothing else to say’, slammed the door and left,” according to Akinci. But Anastasiades said he had left the room during a break. The island split into two sides in 1974 when a pro-Enosis Greek Cypriot coup led to violence against the island’s Turkish population, triggering Turkey’s peace intervention as a guarantor power under treaty. Eide held separate meetings with Anastasiades and Akinci late Thursday and said that the talks would resume next Thursday. Akinci said that Eide should speak up about how the meeting went off track, asking why Eide was hiding the facts. He added that Anastasiades himself had also said at the meeting that the Greek parliament’s decision to establish the commemoration was a mistake. “Anastasiades should express this opinion not only behind closed doors, but also publicly and do what is necessary,” he said. Last Friday, the Greek Cypriot parliament voted to introduce a yearly public school commemoration of a 1950 referendum in which Greek Cypriots voted overwhelmingly for Athens to take over the island. On Monday, Akinci asked Eide to urge Anastasiades not to approve the decision. Talks on Tuesday were cancelled amid disagreement over the Enosis move. Akinci said that the idea of Enosis and the events it triggered had been tragic for Cyprus. The eastern Mediterranean island was divided into a Turkish Cypriot state in the north and a Greek Cypriot administration in the south after a 1974 military coup was followed by the intervention of Turkey as a guarantor power. The Cypriot issue remains unsolved despite a series of discussions which resumed in May 2015. The main goal is to find a political solution as the sides seek to reunify the island under a federal system after more than 40 years of division. Cyprus’ three guarantors — Turkey, Greece and the United Kingdom — were assigned when it gained independence from Britain in 1960.